It’s been said that the United States Senate is the world’s most exclusive club, in the least, it’s certainly the world’s most deliberative body. The support of one Senator, or worse, his or her opposition could bring an issue to a grinding halt or finally get it over the goal line. Which is why Progressive Supply’s Jay Hults jumped at the chance to speak up for small businesses and plumbing distributors on the need to finally get e-fairness legislation passed once and for all. 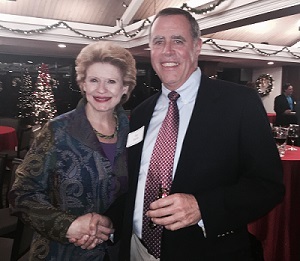 Hults was at a local event with Michigan’s Senior Senator, Sen. Debbie Stabenow and made the best of his time with her. He spoke of the disparity in sales tax collection in light of the holiday season being upon us. With the extended holiday recess coming for elected officials, now is the time to invite them to visit your showroom, warehouse or manufacturing floor. The only thing better than building a relationship with your representatives, is keeping them informed on issues that impact your company and your industry. First Supply’s Joe Poehling hosted Congressman Glenn Grothman (R-WI) in his Sheboygan Gerhards Kitchen and Bath store. Congressman Grothman was given a tour of the branch location, took questions from management and employees and offered his views on legislation such as health care reform and the outlook to finally passing legislation to level the playing field for brick-and-mortar businesses and their Internet competitors. “It was tremendously beneficial to give the Congressman the history of our family’s business and to show him the challenges that small businesses have in today’s changing economy,” said Poehling. 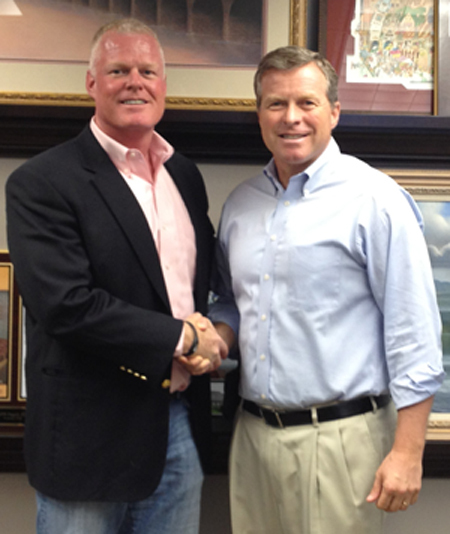 JABO Supply Vice President and Industrial Piping Division Chairman Jay Bazemore welcome Senate Minority Leader Mitch McConnell to their new location in Morganfield, Kentucky. 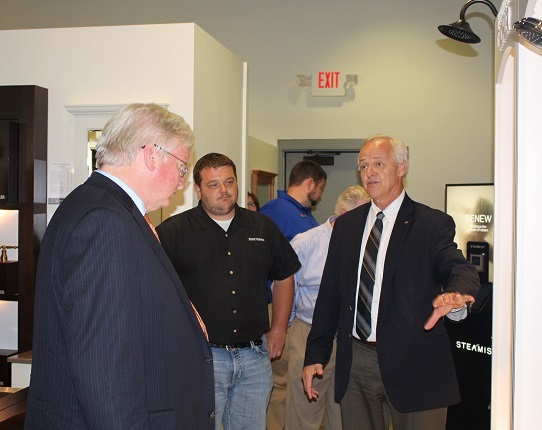 Joined by Kentucky State Representative Suzanne Miles, McConnell was able to see first-hand a small business in his state which deals directly with energy production as well as various industrial entities in that state and beyond. 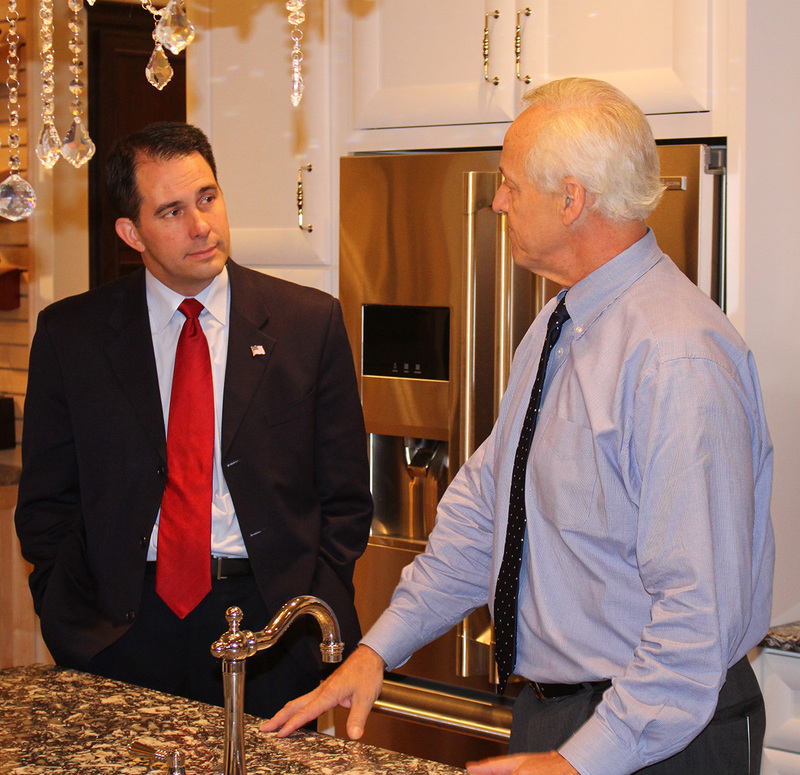 On Monday, Sept. 16, ASA Past President Joe Poehling welcomed Wisconsin Gov. Scott Walker to First Supply LLC in La Crosse as part of Walker's "brown bag" visits program to Wisconsin businesses. During his visit, Walker spoke to First Supply employees about the rollout of new bipartisan legislation aimed at bolstering workforce development, offering tax breaks to businesses and eliminating regulations. Walker said the package would include one bill: to provide vocational rehabilitation for people with disabilities. Do you have a Counter Day or Customer Appreciation Days coming up? Members of Congress use their recess time, also known as the District Work Period to conduct business with those who have sent them to Washington: their constituents. The only thing that is typical of a member’s district is that they all represent approximately 700,000 citizens. Some districts, like those in our urban centers, are so densely populated that may be only be a cab ride long and a few city blocks wide. More than a dozen representatives can claim New York City as their district, and the same holds true for Chicago. What about those legislators in the suburbs or in rural America? Their districts can be so large that they require an airplane to get from one end to the other. When representatives make those long trips, they are hoping to fill every hour of their schedule, getting to know new constituents and the businesses that they represent in Washington, DC. Elected officials and their staff are always looking to meet with interested leaders in the business community and job creators such as you. Unless they hear from you, they may never know the good things you are doing or the challenges you continue to face. A meet and greet is an event a company hosts to exchange views with legislators on issues of concern. It provides company representatives with an opportunity to develop relationships and discuss issues with individuals who are in positions to make decisions affecting your company. This is an excellent way to give elected officials information about the products you manufacture or distribute, including how they are used as essential components of goods used in everyday life. Developing relationships through a meet and greet can be a significant help in influencing future public policy decisions affecting your company. Since a strong personal relationship with policymakers is essential to successful grassroots advocacy, a meet and greet is an effective tool in building long-term relationships. A meet and greet usually works best when kept to an hour in length. The guest can greet the participants and talk informally among them before sitting down to discuss the issues. Since a meet and greet is an opportunity to showcase your company and discuss issues of concern, employees who are articulate and knowledgeable on the issues should participate in the event. Begin the meeting by having the participants introduce themselves, mentioning their affiliations and issues of interest. After the self-introductions are complete, introduce the guest. Have the guest speak for 10-15 minutes about his or her views on the issues, and prior work with, or knowledge of, your company and industry. Be sure to allow time for questions and answers and a dialogue on the issues. You may want to designate specific participants to discuss certain issues to ensure that all priority topics are discussed during the meeting. Let your team know that it’s okay to raise issues other than those that are industry related. For example, do they have children? Then encourage them to talk about education. Obtain the support of the appropriate individuals in your company for the event. Invite the guest by telephone, email, or letter. Be sure to explain the nature of the event and the audience. Offer a range of dates to accommodate the guest’s schedule. Plan to have the event at a plant site or corporate office. Determine the issues for discussion. Designate individuals to discuss each issue to ensure that all the priority topics are discussed during the meeting. Select an individual to introduce the guest and lead the discussion. Send a thank-you note to the guest after the event. Reiterate the points discussed during the meeting. Stay in touch with the guest after the meet and greet. Offer to serve as a resource on industry issues. Place an article about the meet and greet in your company’s publications. Determine the objectives for the visit - Decide what issues you want to discuss and how best to link the issues visually with plant operations. Find out whether the legislator has particular interests. Announce the legislator's visit to all employees - Once the tour is confirmed, promote it throughout the company by distributing a brief biography of the legislator and information about the legislator's importance. Arrange for photographs during the tour - Work closely with the legislator's press aide on publicity and news coverage. Provide the legislator with information on your company prior to the visit - For example, include the total number of employees, the products your company manufactures, and the amount of sales. Choose the tour guide with care - The guide should be articulate, knowledgeable about plant operations as well as issues that concern the company, and know by name everyone the legislator is likely to meet. Map out the tour - Develop a tour schedule and route that illustrates the objectives you set for the visit. Know when the legislator has to leave, and allow for extra time if the legislator wants to remain longer in one location. Prepare key equipment and safety gear ahead of time - Ensure that equipment is operating to provide action interest. Provide safety gear to all participants when necessary. Rehearse the tour the day before - It may be helpful for participants to answer possible questions to prepare for issues the legislator might raise. Begin the visit in your office - Provide the legislator with an overview of important facts about your company's facilities and the tour, including environmental and energy problems and outlays, standards and advances in health and safety, and new products and equipment. Talk in quiet areas along the way - Provide the legislator with an economic profile, including number of employees and amount of payroll, taxes, and local expenditures for materials and services. Be careful to avoid overwhelming the legislator with more technical or economic data than an interested layperson can absorb. Be sure to introduce employees the legislator encounters during the tour - Remember, employees are the legislator's constituents. Conclude the tour with a meeting - A discussion provides an opportunity to answer the legislator's questions and reemphasize key messages and legislative issues in detail. Remember that old saying “We can’t call you; you have to call us.” While elected officials should have a strong working knowledge of their entire district, many times they do not. If they represent a large district, it’s not uncommon for them to be less familiar with the opposite end of the district where they’re based; this is why they look for opportunities to get to know you. Discuss your business with the district director and inquire as to the representative’s possible travels to that part of the district and if they’d be interested in meeting your team and/or touring your facility. Do not be put off if the district director asks to visit first, this is also beneficial and ultimately advances the relationship between you and your representative. Let us know how we can help and don’t hesitate to use our office to assist your needs.